Recommended for 1 CPE in Behavioral Ethics at the basic level. Program is suitable at the basic level for accountants who are responsible for reinforcing ethical behavior in their organizations or clients served. OK Ethics makes no guarantees as it is up to the individual practitioner to determine relevance to their specific area of practice. Spirit Aerosystems Schnake Turnbo Frank Tulsa Regional Chamber Cherokee Nation Cox Communications, Inc.
Brian A. Black, D.M. serves as the Human Resources and Environmental, Health & Safety Senior Site Leader for Spirit AeroSystems Oklahoma Operations, a global leader builder of aerostructures, systems and components for commercial and defense aircraft. In this role Dr. Black is responsible for providing strategic leadership support to Oklahoma business leaders and building people capability in support of business goals and objectives aligned with Spirit through Community Relations Manager, Public Affairs & Diversity Senior Manager, Executive Development & Diversity Senior Manager and Senior Manager, Oklahoma Human Resources. Dr. Black holds Bachelor's and Master's degrees in business from the University of South Carolina In addition, he earned a doctorate of management in organizational leadership from the University of Phoenix. Dr. Black held several positions within the National Urban League system including the Urban League of Portland, Oregon Vice President of Programs, the Urban League of Upstate South Carolina Regional Senior Vice President and Chief Operating Officer and the Urban League of Kansas President and Chief Executive Officer. Dr. Black has received numerous awards and accolades including the Spirit AeroSystems Leader in Diversity Award, Butler Community College Diversity Leadership Award, National TRIO Achiever Award, Wichita Business Journal Leaders in Diversity Award, A. Price Woodard Humanitarian Award and the Kansas Health Foundation and the Charles F. Kettering Foundation Fellowships. Dr. Black has served on numerous community boards and committees and currently serves as a member of the Newman University Board of Trustees, Tulsa Air & Space Museum & Planetarium Board of Directors, Sigma Pi Phi Fraternity Grand Boule Education Committee and Fellow of the Executive Leadership Council. Dr. Black is a member of Sigma Pi Phi Fraternity Epsilon lota Boule and Metropolitan Baptist Church, Tulsa Oklahoma. Born in Manama, Bahrain and raised in Tulsa, Tahira Taqi now works as an account executive and inclusion and diversity specialist at Schnake Turnbo Frank. She graduated as the Outstanding Senior from the Gaylord College of Journalism and Mass Communications at the University of Oklahoma with a bachelor's degree in public relations and minors in Chinese, international studies and psychology. Tahira will graduate this year with her MBA with an HR certification from Oklahoma State University. Tahira started at Schnake Turnbo Frank, a public relations and leadership consulting firm, three years ago and continues to grow the firm's internal an external inclusion and diversity efforts. In April 2017, the firm held the inaugural Inclusion & Diversity Summit in Oklahoma City. To continue the dialogue around inclusion and diversity, Tahira developed the I&D Consortium. Monthly meetings allow community leaders to come together to network, learn to grow on their journey to making our marketplaces and communities inclusive and diverse. This Consortium has grown from 50 members to over 560 members from 175+ companies in the last year. She is a strong advocate for all, believing that everyone should have the ability to be who they are, without fear of oppression or persecution. Tahira is certified in unconscious bias and cultural IQ by the global Cultural Intelligence Center and continues to stay active in the community through her work with the Mental Health Association Oklahoma, A New Leaf, Street School, Reading Partners, the Suravya Anne Foundation, STAAR Foundation, the Tulsa Area United Way and the Oklahoma Center for Nonprofits. 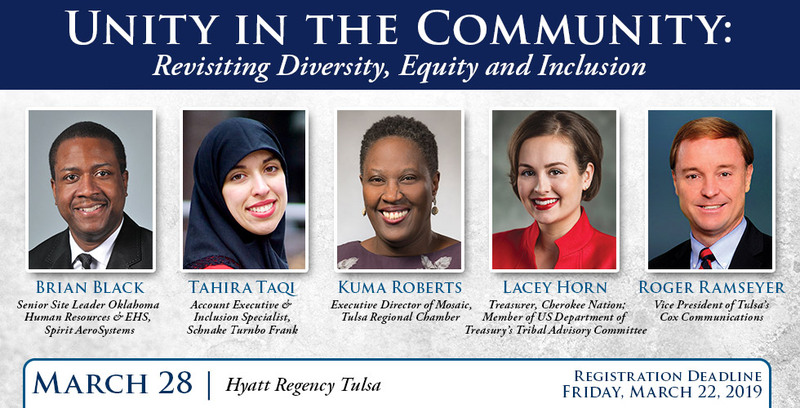 Kuma Roberts currently serves as the Executive Director of Diversity, Equity and Inclusion for the Tulsa Regional Chamber of Commerce. 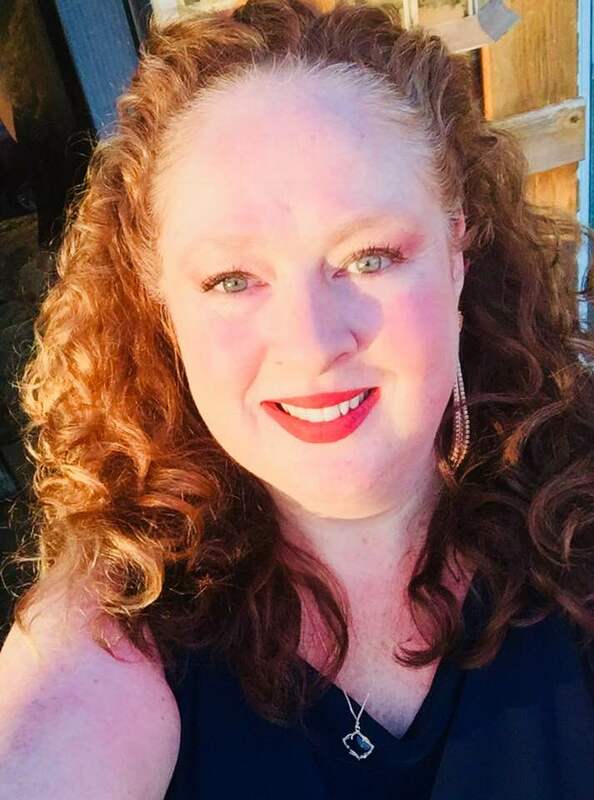 She has been at the Chamber for 8 years and has served in various capacities including, Program Manager for Education and Director of Talent Attraction & Retention. In her role as Executive Director Kuma is responsible for driving Chamber D & I strategies as well as the cultivation of a supportive and inclusive work environments in the Tulsa region. She serves on various local boards including: Leadership Tulsa, TAUW Women’s Leadership Council, Tulsa Area Human Resources and Workforce Tulsa Innovative Workforce Opportunity Council and Girl Scouts of Eastern Oklahoma. She is a proud member of Leadership Tulsa Class 51 and was recently appointed to the inaugural City of Greater Tulsa African American Affairs Commission. Kuma is passionate about education, equity, social justice and her community. Serving as Treasurer for the Cherokee Nation, LaceyHorn is chief financial officer for the largest tribe in the United States. She began her career with KPMG-Chicago and interned at Hunt Oil. Lacey is a board member of the Oklahoma Center for Nonprofits and the Native American Rights Fund (NARF). She has appointments to Treasury and GASB advisory committees. Lacey earned two degrees from SMU and is a licensed CPA. Roger Ramseyer serves as vice president and market leader for Cox Communications' operations in northeast Oklahoma. In this role, Roger champions the customer and employee experience with a strong focus on operations, employee engagement, government and regulatory affairs, marketing, diversity and inclusion, and growing talent in the Tulsa market. He is responsible for alignment between regional and corporate reporting teams including operations, Cox Business, Cox Media, Cox Radio, Cox Television, Cox YurView Oklahoma, and Cox Residential Services, and various field services, construction, and outside plant maintenance teams. Before coming to Cox, Roger served as managing director of global government and public affairs/corporate communications for INVISTA and Koch Industries in Wichita, Kansas. He also served as vice president and managing officer of a Koch family foundation. Roger worked for Bank IV and NationsBank (now Bank of America) for 12 years where he served as corporate spokesman and senior vice president of corporate marketing. Roger has been a longtime community advocate in the communities in which he has lived and has held leadership roles in a variety of civic, religious and educational organizations. Roger is a member of the board of directors of the Tulsa Regional Chamber of Commerce, where he currently serves as vice-chair of government relations and for which he will serve as board chairman in 2020. He also serves on the board of the Oklahoma BizPac, is a member of the Rotary Club of Tulsa, and is a trustee of the Tulsa Community College Foundation. He holds a BS in Business from the University of Kansas and an MBA from the University of Texas at Austin. **Parking Options - Below are two additional parking options to the garage for the Hyatt Regency! Lot A - corner of 2nd & Boulder. $4 for 2 hours up to $8 max. Lot F - corner of 2nd & Cincinnati. $1 per 1/2 hour up to $5 max. Both lots have pay boxes and accept cash & credit card. Consider co-hosting this event or purchasing additional tables. Member table of 8 - $500. Non-member table of 8 - $700. Contact Jalisha at (405) 889-0498 or Shannon at (405) 858-2233.